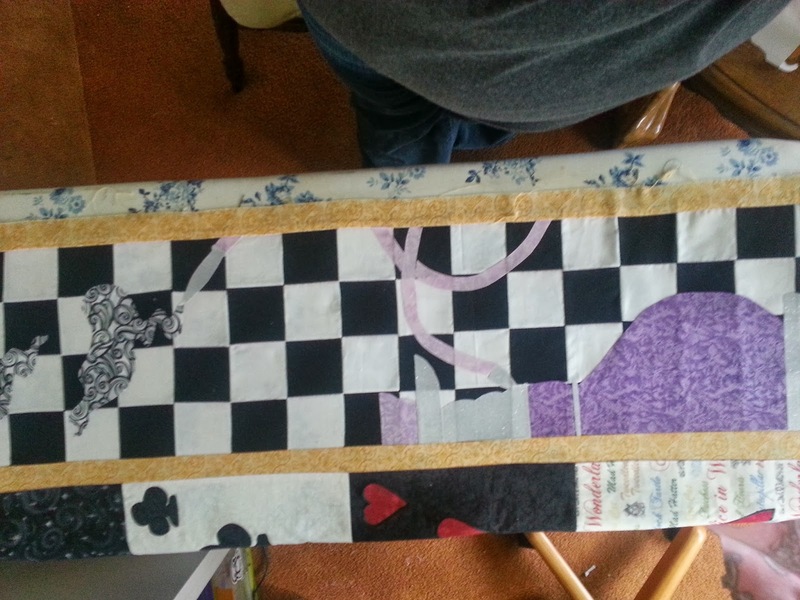 There was work again on the Alice Quilt. 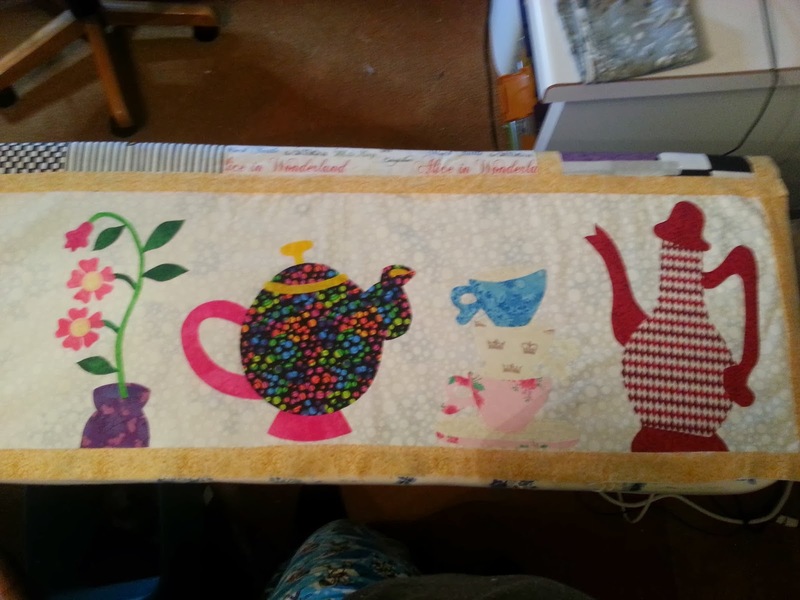 When I'd last worked on what was the whole of it, I came to the sad realization that my grand idea to have the wall hanging as the centerpiece for the whole quilt was not going to work. Nothing was lining up right. The only solution I could come up with was to rip apart the blocks and start piecing them without the wall hanging. This was about a month or so ago. I had packed it away (again) after that, not wanting to look at it again.But then, Mom kept hounding on a sewing day. I've been doing better with the occasional high pain day. I decided it was time to finish the wall hanging. This is how it's sat for almost a year. I had ideas for the side with the checkered board. Things ranging from a garden scene with flowers, to hookahs, to tweedles and to the original pattern design of the chess board. The bottom is the only area I knew for sure I was going to change from the original pattern. For a long time that was going to be my garden scene, but this pattern bothered me because there was no March Hare. When you have something you've worked on on and off for 2 years, you come up with crazy things. 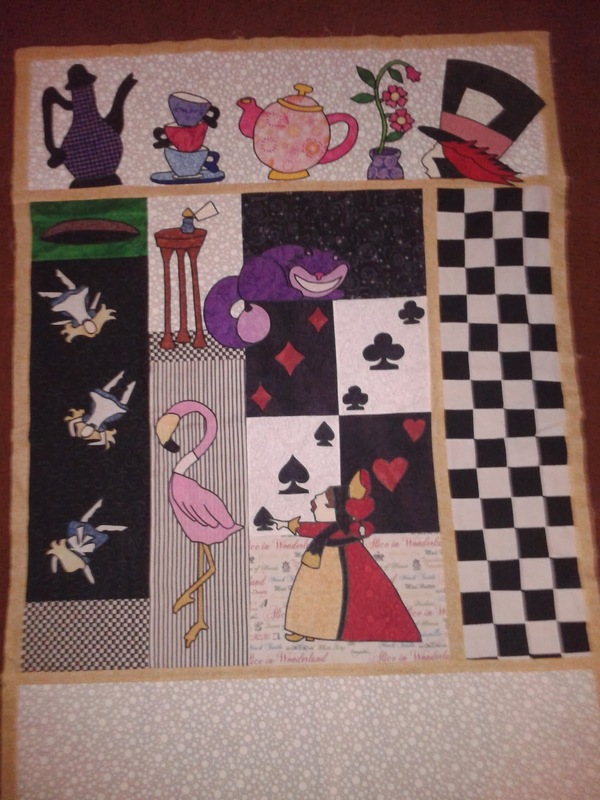 It was finally decided the bottom panel would be a mirror of the top panel with the Hare instead of the Hatter. Even with that decided, with the issues with my hand, drawing my own design for the Hare seemed daunting. There was still that side panel. 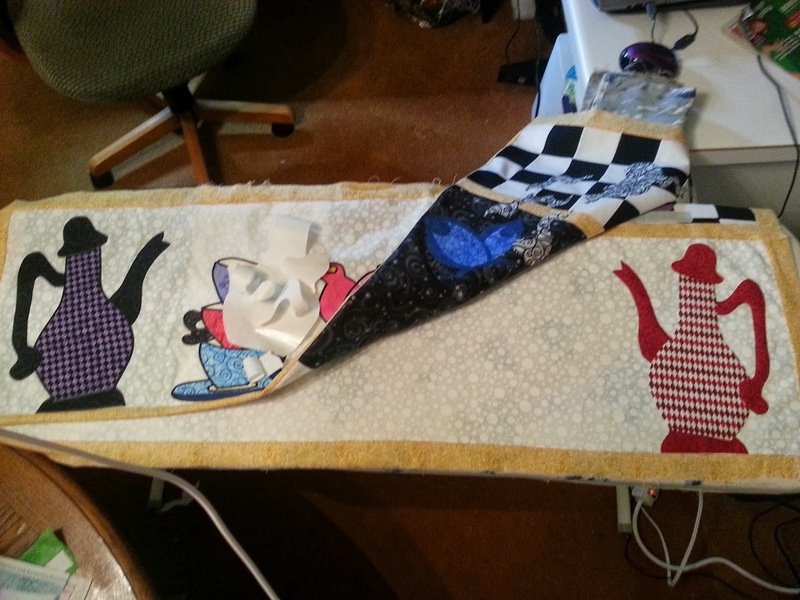 So the poor quilt was tossed around and folded and refolded and shown off by everyone other then me over. When I pulled it out today to work with my Mom, desicisons where made. Drawing was done. I'm all around happy with how it is FINALLY finishing up. I started with the checkerboard. Sometime in the haze of the last few months, the Idea of the hookah stuck. I turned it over and over in my mind about how I'd do it. Today, I sat down with my Kindle and freezer paper and started to drafter a pattern. While it's backwards from what I had planned (the whole damn quilt is backwards from what the original pattern was) I still dig how it turned out. It actually works better because the smoke goes up into the next panel leading to my favorite detail in it so far. That my friends, is Absylum. This was taken before he got antenna and the flash washed out his color. His blues are dark. Again, his hand drawn by me. The swirly cloud under him is smoke from his hookah. I wanted it to cross the panels to help things better flow together. The empty space above Ches bothered me a lot. I knew a long time ago that the space was meant for the butterfly. The two needed to be together. I love him. I can't wait to use the hot ribbon on him to bring out more detail. So then came the bottom panel. For some reason, I was dreading this panel the most. 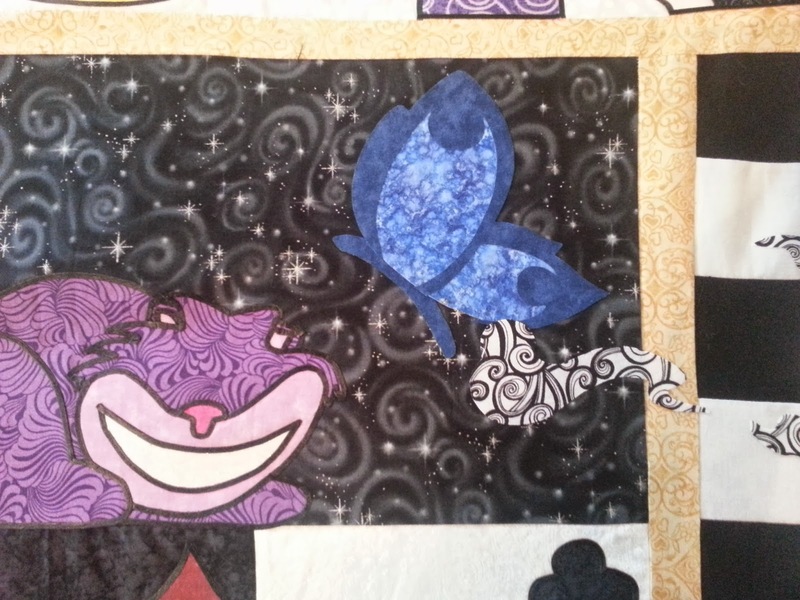 Since this quilt and me have a history with ending up the wrong way, I was sure this panel was going to be the death of me. It actually went together really quick. And was going the right way! You have no idea what that meant to me! I changed up the colors of the tea pots and cups. I just couldn't have them match the top. The placement and even the spacing between them is the same as the top panel. Now your wondering, 'Where's the Hare?!' It was about 8pm when I finished work on the bottom panel. I took my freezer paper and layed everything out on the floor and started to draw the Hare. What I'd done in my sketchbooks a few weekends back was far to small to fit in the empty space. So I started from scratch with him. It wasn't going right so instead of forcing it, I packed everything up for the night. We are at the finish line though. Once the Hare is done, the new pieces will just need the boarder of hot ribbon and I can FINALLY put this damn thing together and hang it for people to enjoy! Though I keep hearing I should enter it in a contest. All I care about is the fact I worked a huge chunk of the day with no pain, no numbness or anything in my hand. I've been having some issues with my neck, but nothing with my hand. Once this is done, I won't feel so guilty about starting more. My own designs this time. I have so many things floating in my head and so much fabric to use! Dolls won't be far behind either and the drawer of Monster High create-a-monster dolls can be used and I'll make my Marshal Lee finally. Heck! I might even make a Fionna to go with him!